Monday 5th – Saturday 10th March 2018. 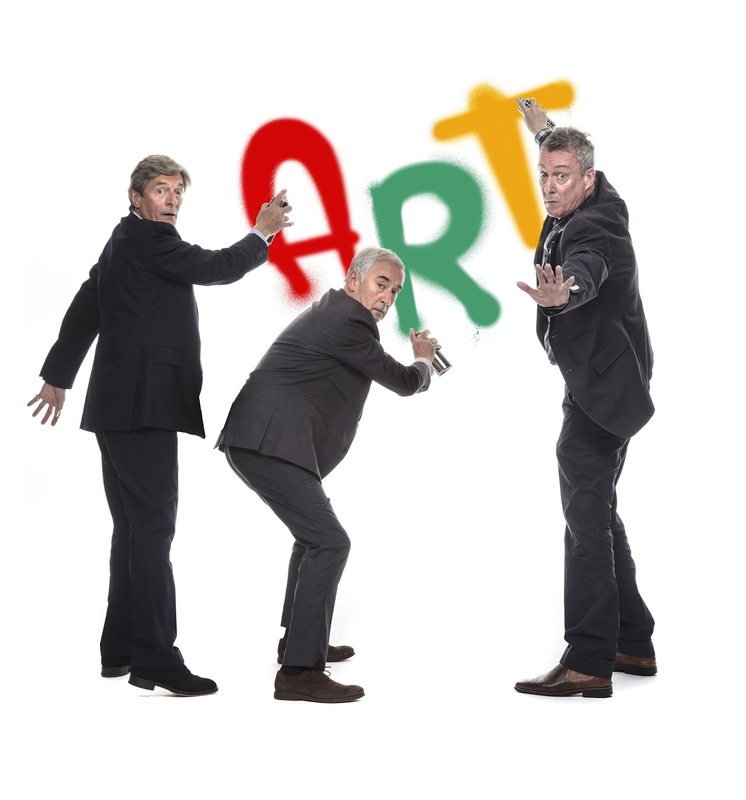 Nigel Havers, Denis Lawson and Stephen Tompkinson will star in a tour de force revival of the Olivier, Tony and Moliere award-winning comedy ART at Newcastle Theatre Royal. One of the most successful comedies ever and winner of every major world theatre award, ART is a stage masterpiece and global phenomenon. Now celebrating its twentieth anniversary, ART tells the story of three old friends in Paris - Serge, Yvan and Marc, who discover they have very differing opinions about what constitutes ‘art’ when one buys a very expensive, rather peculiar painting. Nigel Havers’s films include Chariots of Fire, A Passage to India, Empire of the Sun and The Whistle Blower. He has starred in many television productions, including The Charmer, Dangerfield, Manchild, and, more recently, the hit US series Brothers and Sisters, Lewis Archer in Coronation Street, Benidorm and Lord Hepworth in Downton Abbey. His numerous theatre work includes The Importance of Being Earnest and Harold Pinter’s Family Voices, both directed by Sir Peter Hall for the National Theatre, Richard II and Man and Superman for the RSC, the hugely successful touring productions of Rebecca and Alan Bennett’s Single Spies. Denis Lawson is known for his roles as John Jarndyce in the BBC's adaptation of Bleak House, for which he was nominated for an EMMY award, and as DI Steve McAndrew in BBC1's hit series New Tricks. In film, his notable credits include the roles of Gordon Urquhart in the film Local Hero and Wedge Antilles in the original Star Wars trilogy. On stage, he won an Olivier Award for Best Actor in a Musical for his performance as Jim Lancastar in Mr Cinders at the Fortune Theatre, and he was nominated for an Olivier for his performance as George in La Cages Aux Folles at the Playhouse Theatre. Stockton-on-Tees born Stephen Tompkinson’s TV credits include five series of DCI Banks, four series of Trollied, seven series of Wild at Heart, six series of Drop the Dead Donkey (British Comedy Award Winner for Best TV Comedy Actor) and three series of Ballykissangel, and his films include Phil in Brassed Off. His theatre work includes Spamalot, Rattle of a Simple Man and Arsenic and Old Lace in the West End, Cloaca (Old Vic) and Tartuffe (National Tour). Based on the original production by Matthew Warchus, ART will be directed by Ellie Jones, with design by Mark Thompson, lighting by Hugh Vanstone, sound design by Mic Pool, original music by Gary Yershon, fight direction by Terry King and casting by Sarah Bird CDG. The 2018 UK & Ireland Tour is produced by David Pugh & Dafydd Rogers.